My beauty regimen has always been based on simple efficacy. I like things that work, keep my skin from breaking out or being too dry and don't require a great time commitment. When I was younger, I was totally a wash and go girl but now that I am getting older, I'm not adverse to making a little more effort to keep my skin looking smoother and more, uh, radiant with targeted anti-aging products. Scandinavian women have long been admired for their supple, clear skin and timeless beauty, thanks to the potency of the region’s resources and a culture of health and well-being. Now Freya is tapping into Scandinavia’s natural advantage in the battle against aging to create a powerhouse skincare system that is truly in a class by itself. Freya is apparently the first brand in the cosmetic industry to nano-encapsulate marine based Omega-3 fatty acids, as well as LEXA™, a never-before-seen patented ingredient shown to boost collagen production by over 600%. And besides, the line is called Freya, ostensibly named after the Norse goddess of beauty, love, war and death. How cool is that? Those Viking descendants are pretty badass and it certainly couldn't hurt for a little of that to trickle down my way. 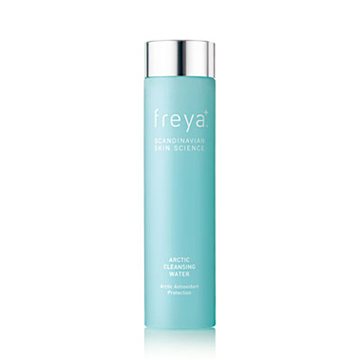 I received a full-sized sample of Freya Arctic Cleansing Water to try out. Even the bottle is stately and calming, a stoic column of aquamarine and silver that feels cool to the touch. You twist the silver cap up to reveal a hole in the top, which you dab with a cotton ball to release the kraken. I mean, the cleansing water. Now, when I mentioned before that I am a wash and go girl, I should also tell you that I have never used a cleanser that you didn't have to rinse off. I'm prone to oiliness, so it just seems counterintuitive to me that you wouldn't want to rinse. You don't rinse Arctic Cleansing Water off but it gets all the day's detritus off your skin and leaves it dewy soft. In fact, even in the dead of this insanely cold, dry winter, I could probably forego moisturizing after using it without turning into a shriveled crone. It's pretty awesome. I should also mention that it's hard for me to review one skincare item without trying the rest of the range but this is actually a very good standalone all-in-one product. Like I said, it gently cleans and conditions the skin. I also tried it on eye makeup in the name of science and it did a great job. I was very impressed. I wish that Freya offered a travel kit so I could try the whole line without dropping a bundle. I am especially interested in the undereye dark circle and puffiness reduction capabilities of the Freya Firming Eye Cream, since that is my personal beauty pet peeve. To learn more, like Freya on Facebook or follow @freyaskincare on Twitter. In accordance to the FTC Guidelines and the WOMMA Code of Ethics, I am disclosing that I received a sample to facilitate this review. No compensation was provided, although I might earn cash or credit if you buy something after clicking on one of the affiliate links. All opinions are, as usual, entirely my own.